OWI-EXP-535 CD curriculum provides multiple step-by-step activities and experiments for the OWI-535 Robotic Arm Edge robot in both manual and computer control modes. 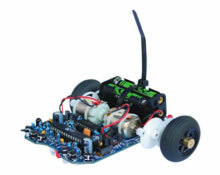 Students are challenged to measure and record robot specifications, perform experiments, solve problems, record data, reflect about their activities and answer questions in each robot lab activity. Using the site license that comes with the product, directions may be read off a computer screen or made into printed masters and copies. This curriculum when combined with the OWI-535 Robotic Arm Edge creates numerous and flexible educational opportunities for students. Answer keys provided. This is a flexible robotics curriculum for individual student use, home schools, science museums, and schools. CD is Mac and PC compatible.